From August 2009 until July 2011 I was gigging in a duo with the jazz and blues guitarist Dave Jenkin, which rekindled my passion for performing live music in small venues, playing fretless bass guitar and bass drum together. With the addition of bluesy slide guitar, harmonica and vocals, we covered a variety of tunes, from pop and blues standards to jazz and rock classics. 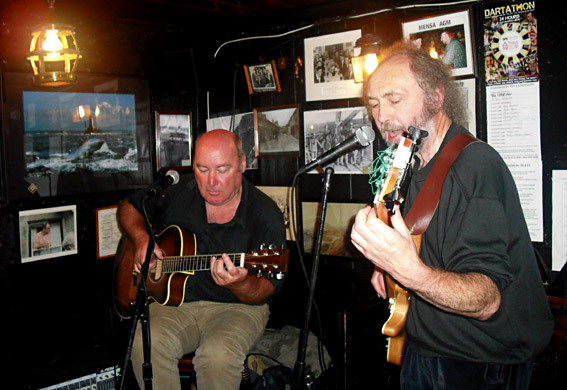 We continued playing the Open Mic Nights at The Star Inn, St Just on Thursdays, until October 2013. Dave and I also played occasional dates with St Just legend John Turner  on main vocals and electronic drums. We performed a variety of '60s music by The Stones, Spencer Davis, The Kinks, and some classic rock n' roll tunes. This line up was called Long In The Tooth. This site is a history of, and tribute to, the many musicians and bands I have worked with over a period of more than 45 years. It includes information on each band with photos and a complete list of every gig I have played, including locations, band members and full instrumentation. I started playing electric guitar in the late sixties and began gigging in the south-east of England from 1970. After moving to West Cornwall in 1984, I switched to playing bass guitar. I am currently doing occasional studio / recording work using a Kif 5 string fretless bass guitar, and a Jackson 6 string electric guitar.